So, as per plan, we reached Shimoga around 10 in the morning. After some hiccups with our car, we were on our way to Mandagadde. We reached Mandagadde around 12pm. 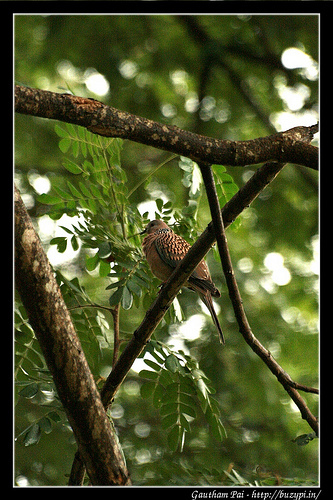 Mandagadde is a small bird sanctuary. You see trees dotted with waterbirds and it is a pleasant scene. There are quite a few monkeys engrossed in their usual daily routines. 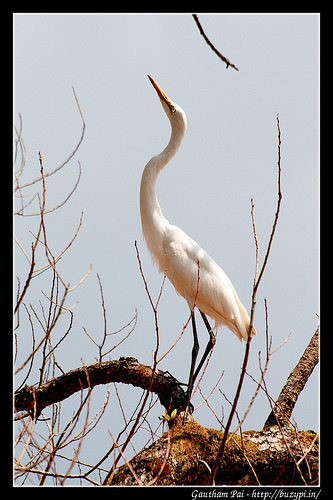 There is a bird watching tower, which can give you a good place to spot and click snaps. Although we spotted a coracle, there was no one who could take us closer to the birds, so all we could do was to wait for the birds to approach us and then use our telephotos to click them. After a few snaps, we headed towards Thirthahalli. At various spots on the road, you can get a peak of the Tunga river. The road is covered with dense forests on either sides. We had a quick lunch and then took a deviation to a place called Chibbalagudde. The road to Chibbalagudde is deserted but quite scenic. 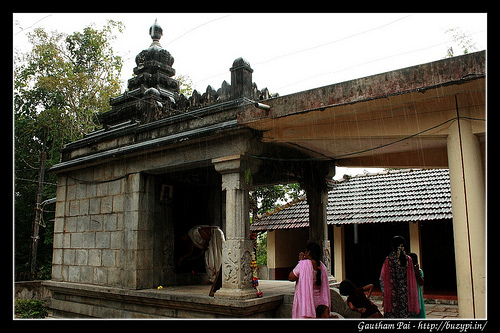 There is a Vinayaka temple in Chibbalagudde. Locals believe that the God here can cure “Chibbala roga” (a type of skin disease), hence the name. The river Tunga flows just behind the temple and it is the home to some really huge fishes. Fishing is prohibited here and it is considered to be a sin to catch or harm them. From here, we moved towards Mrugavadhe, yet another historic place, from the Ramayana times. It is only after returning did we realize that we actually didn’t visit this place, but some other temple that just happened to be on the way. We then went to Kuppalli. 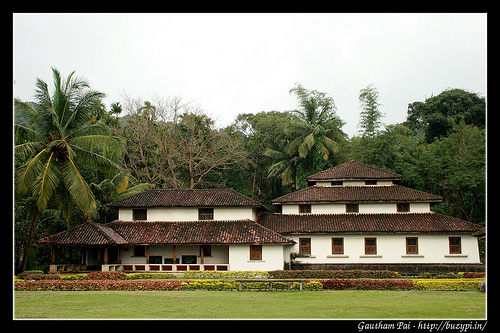 Kuppalli is the birth place of the famous poet Kuvempu. Even to this day, there are very few houses in this place. The first place you come across, is the new centenary building built in the remembrance of the great poet. The building has a very symmetrical design and is well maintained. On all the walls in the interior of the building are verses from Kuvempu’s various works. There is a dormitory, a kitchen and a library. Further down, you reach a dead end where you see Kuvempu’s ancestral home. One thing that surprised us was that, in such a remote place you see KSRTC’s bus service. The setting is perfect. On the backdrop of the house are tall trees and further ahead are hills. There is a small entrance fee, and then a guide shows you around. It is said that as many as 35 people used to stay in this house. The house has various items from old times, including kitchen items, furniture, cupboards etc. 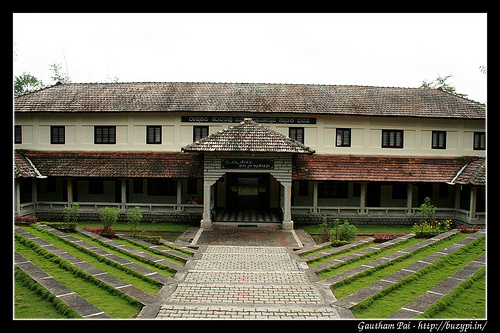 There is a small museum of Kuvempu’s works. In another room are photos of various important times in Kuvempu’s life right from his childhood to the time when he was old, including his meetings with various other poets. We then quickly visited Kavi Shaila. It was already dark and there was a light drizzle as we reached the hill top. We had to return to Shimoga and then go to Mattur, where we were to halt for the night. My friend, Anand, at whose place we were to stay for the night, had already given us the warning of late evening rains. It was too late. We couldn’t avoid the heavy downpour as we passed the dense forest on the way to Shimoga. Somehow we made it to Mattur and were welcomed by a magnificient dinner and hospitality at my friend’s house. The next morning, we got up a little late, and took a stroll through the Sanskrit speaking village. Anand showed us around. Mattur is a very small village on the banks of Tunga. There are specialized Sanskrit schools and everyone is introduced to the Sanskrit language in the regular school. We spotted quite a few birds here and you can easily spend a couple of days appreciating this place. We got ready, had breakfast and left to visit the Elephant Camp in Sakrebailu. 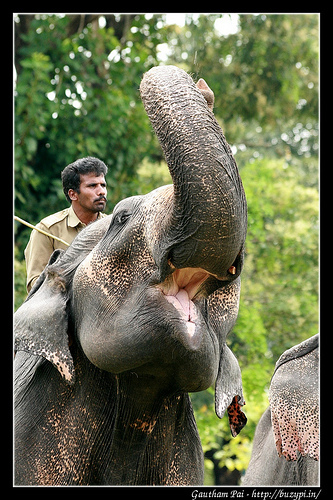 Sakrebailu Elephant Camp is built on the banks of the Tunga river. It is open on Sunday morning to the general public. 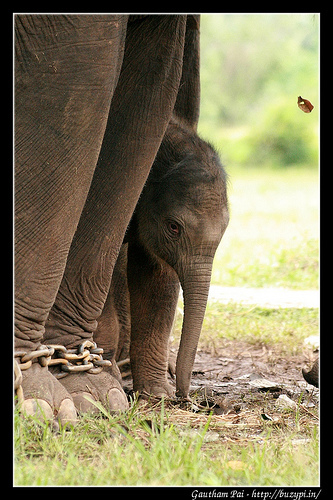 It was recently in the news, as one of the elephants had given birth to a baby which was hardly a couple of weeks old. We roamed around, and clicked several shots of elephants. There was a show put up for the people who had visited the camp. There were elephant races. The elephants were made to perform several acts like moving around in a circle by holding the tail of the elephant in front of it, they were made to bow to the crowd etc. Next stop was Gajanur dam. Photography is prohibited in this place. So we just walked down to a place where we can see the water gushing through the gates. Most of the attractions in this place have some connection to the river Tunga, in this case, the Gajanur dam is built across the river. Our next visit was to Shivappanayaka Palace. 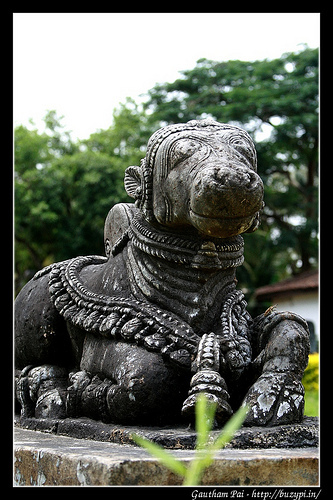 This palace has several statues from various Hoysala temples in Shimoga district. The statues range from 10th century AD to 15th century AD. 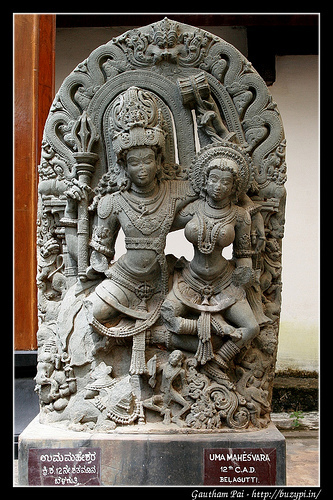 There are statues of various gods and goddesses, depicting scenes from various stories. There are also artifacts from the Harappa times and the stone age and a few, very old, literary works. After clicking a few snaps, we decided to call it a day. We were tired from the journey and decided to head back to Bangalore without any stops in between.